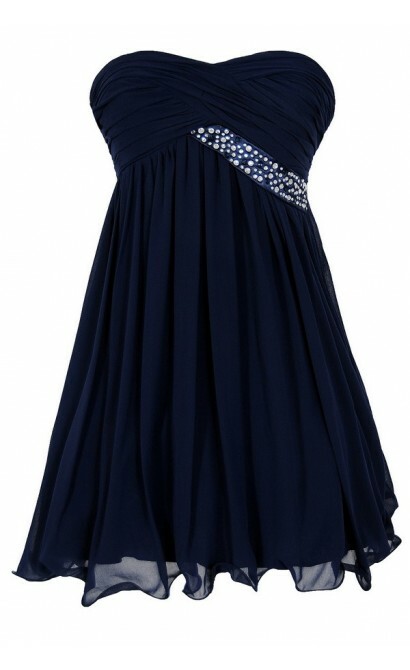 You have added Trail of Stars Embellished Pleated Chiffon Party Dress in Navy into shopping cart. FINAL SALE. This glamorous and sparkly chiffon party dress features a trail of rhinestones beneath the bust that reminds us of stars. The Trail of Stars Embellished Pleated Chiffon Party Dress is fully lined and made entirely of chiffon. It has a sweetheart neckline and lined and lightly padded bust for support. We absolutely love the pleated chiffon at the bust that forms a crisscross design. A band of rhinestones below the bust adds the perfect extra shine to this dress. The attached skirt is fully lined and has an invisible layer of tulle underneath to give the skirt some volume. A fabric tie at the back of this dress can be cinched to control the fit and a hidden back zipper completes this dress. The Trail of Stars Embellished Pleated Chiffon Party Dress would be perfect paired with pumps or metallic heels and a clutch for any upcoming dance, party, or semi-formal event. This would also make a pretty bridesmaids dress. Also available in Red. Details: Fully lined. Lined and lightly padded bust. Hidden back zipper. 100% polyester. Professional spot clean only. Size 3 measurements: Length from top of bust to hemline: 28”. Bust: 30”. 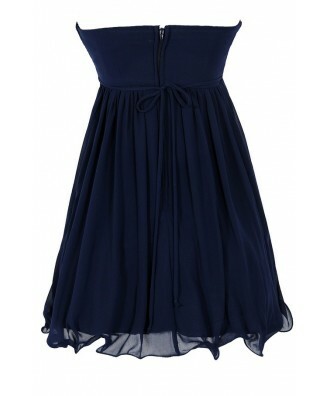 You have added Trail of Stars Embellished Pleated Chiffon Party Dress in Navy into Wishlist. You have added Trail of Stars Embellished Pleated Chiffon Party Dress in Navy for Stock Notification. 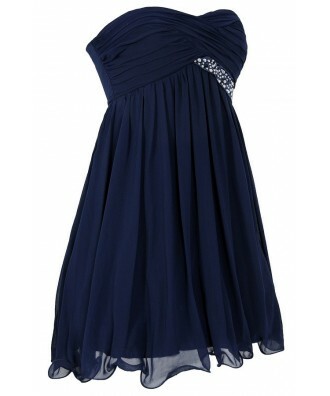 You have set Trail of Stars Embellished Pleated Chiffon Party Dress in Navy as a loved product. 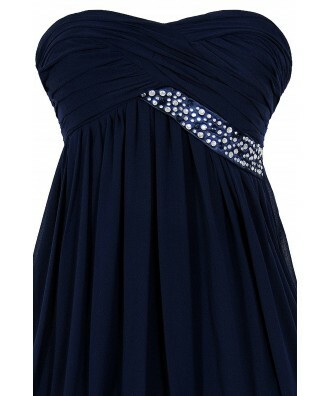 You have removed Trail of Stars Embellished Pleated Chiffon Party Dress in Navy as a loved product.